Rio Grande City CISD's Dillon McGuffin and Andres Salazar named District Champs in the District Spelling Bee held recently. McGuffin is a Ringgold Elementary student while Salazar attends Veterans Middle School. 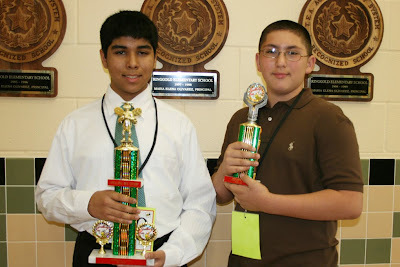 Both students qualified for the Regional Spelling Bee to be held at South Texas College campus in Weslaco on Saturday, March 6, 2010. McGuffin is the son of Mr. and Mrs. Lamar and Patrick McGuffin and Salazar's are Mr. and Mrs. Pedro and Rosa Salazar. Congratulations to both students and we wish them luck at this Saturday's meet.